The talks surrounding the Syrian reconciliation process that the United Nations and Arab League Envoy to Syria, Staffan de Mistura, has been desperately trying to start in Geneva, don’t seem to be gaining any momentum. Even despite the fact that the envoy has officially declared the talks open on February 1, they didn’t even start due to the fact that the Saudi-backed High Negotiations Committee failed to appear at the Palais des Nations. Instead members of the opposition preferred to speak with journalists, saying that before the start of the negotiations a number of preconditions should be fulfilled. Yet, numerous observers believe that an attempt to link the start of negotiations with the demands addressed to Damascus may an be an attempt to block the negotiation process altogether. The current Permanent Representative of the Syrian Arab Republic to the United Nations, Bashar Jaafari, has pointed out that just like during the Geneva-2 negotiations, representatives of Damascus believe in the fundamental importance of the question of combating terrorism. In addition, he pointed out that the opposition hasn’t even presented the list of its negotiators. In addition, the Turkish president demanded the expulsion of Kurds from the Syrian peace process. From his point of view, the Kurdish People’s Protection Units is an equivalent to armed terrorists. Despite the fact that the international community and the UN has taken every effort to resolve the Syrian crisis and implement a ceasefire along the border areas with Turkey, Kurds are being subjected to daily shelling carried out by large-caliber Turkish artillery units that are claiming the lives of the civilian population. It’s no coincidence that various experts have begun voicing an increasing amount of criticism of the West, which backed down immediately once it was blackmailed by Erdogan. Therefore, Syria’s Kurds, along with secular and progressive forces were left abandoned. Yet, Saudi-backed terrorists like the High Negotiations Committee have been allowed to take part in the negotiations, even if they’re openly declaring their intentions to establish sectarian extremist rule in Syria. The French Figaro reminds us that that the head of the High Negotiations Committee comes from Jaish al-Islam the Salafi group that has been a part of the Syrian branch of Al-Qaeda. In this respect the continuous attempts to deprive Kurds of a chance to take a part in the determination of Syria’s future appear bewildering at best. After all, there’s more than 2 million Kurds residing in Syria who have played an important role in the fight against ISIS and the defense of cities like Kobani which was besieged by terrorists. In recent years Kurds, both Syrian, Iraqi and Turkish, have been the tip of sword striking back against the Islamic State. Moreover, they have managed to block the supply routes running across the border to Turkey putting an end to the oil smuggling operations that were run by the Turkish president and his affiliates. For this reason alone, the Kurds are instrumental in any successful resolution of the Syrian crisis. The tactics employed by Erdogan are based on excessive hostility towards Kurds both in Syria and Turkey, coupled with the aggravation of bilateral relations with Russia and the continuous support of terrorist groups in Syria. Once Turkey has gotten deeply involved in the conflict in Syria, leaving behind its policy of non-interference in Arab-Muslim affairs, Ankara has lost the right to claim that it can serve as a “fair referee” between the parties of the conflict. Therefore, the West should stop courting this “authoritarian democrat” – Erdogan – who only understand the power of force. One shouldn’t forget that Turkey is much more dependent on the West than the West is dependent on Turkey, especially in economic terms. Now, as it has been reported by Reuters, the negotiations are going to be postponed until March 9, “for logistical and technical reasons.” According to Staffan de Mistura, the contradictions between the parties lie in the areas of combating terrorism and among humanitarian concerns. Yet, as one can tell from the statements made by delegations, the contradicting positions of the negotiators haven’t changed a bit, regardless of the fact that it will be the third attempt to put an end to this conflict which has been raging for five years, claiming the lives of more than 250,000 people, and transforming a total of four million people into refugees. 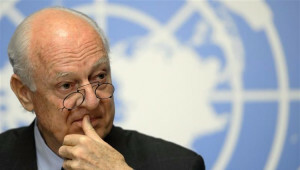 The United Nations and Arab League Envoy to Syria has also said that talks will concern constitutional reform in Syria and the possible elections that may be held within the next eighteen months. Given the importance of stopping the bloodshed in Syria, one can only hope that the external sponsors of this war will finally leave their ambitions aside, investing their hearts and minds in the negotiation process which may finally bring peace to Syria and the whole Middle East.